This entry was posted in Which Open Source Blog on June 30, 2014 by Administrator. Zayra is a trendy One Page HTML5 & CSS3 responsive template built on Bootstrap 3. Advertise and sell your App featuring a clean and minimal design, offer the best possible web experience to your visitors thanks to Responsive and Retina features. Muriel is a responsive Coming Soon Template with amazing navigation. Images from demo site are not included. This template can be used for Corporate Website, Personal Portfolio, Gallery Photo, Agency Website, and Business Website. its very easy to edit any and all of the design. It is made with modern responsive design, awesome typography and focus on readability. Highly customizable so it can match your personal taste. 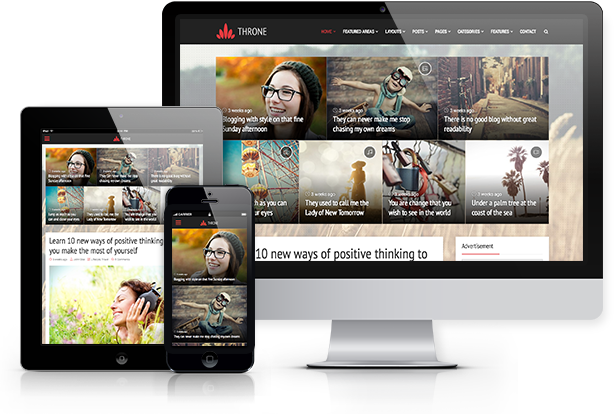 Also, Throne theme is developed with SEO in mind, as well as for fast page loading and security. Images used on demo website are purchased from ShutterStock and downloaded from Unsplash and they are all credited to their respective creator/owner. These images are not included in theme package. It is crafted so that it looks beautiful, has all the vital elements and works flawlessly. Borg brings new quality to the table – simple, valid, well-written HTML5/CSS3 code makes the template fully responsive, lightweight, easy to use and customize. Created with Bootstrap and LESS. “Cubex PSD Template” is a great theme packed with 14 well laid out and pixel perfect PSDs based on Bootstrap grid system. “Cubex” is a multi-purpose theme that is suitable for any type of business. Template designed for WordPress, Joomla and other systems. All the layers are organized in groups and are fully editable. All the images are just used for preview purpose only and not included in the final purchase files. Frost was built with awesome Twitter Bootstrap v3 and it features 34 cool HTML5 pages with 9 color options. Since it is responsive, the layout will adapt to different screen sizes which will make your website be compatible with any device such as smart phones, tablets or desktop computers.